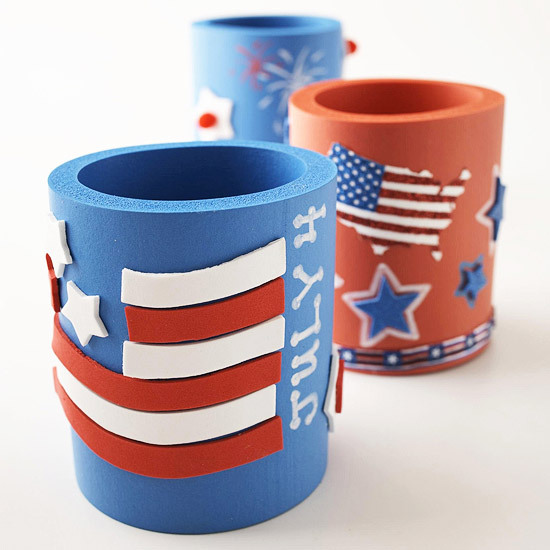 Celebrate Independence Day with the family by making these creative and patriotic crafts for kids. 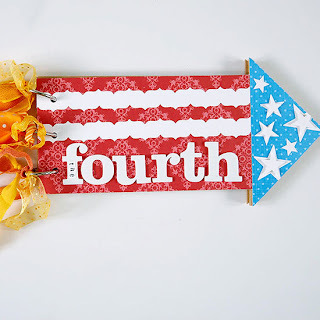 From festive decorations to bike embellishments, it's easy to start your 4th of July celebration with a bang. 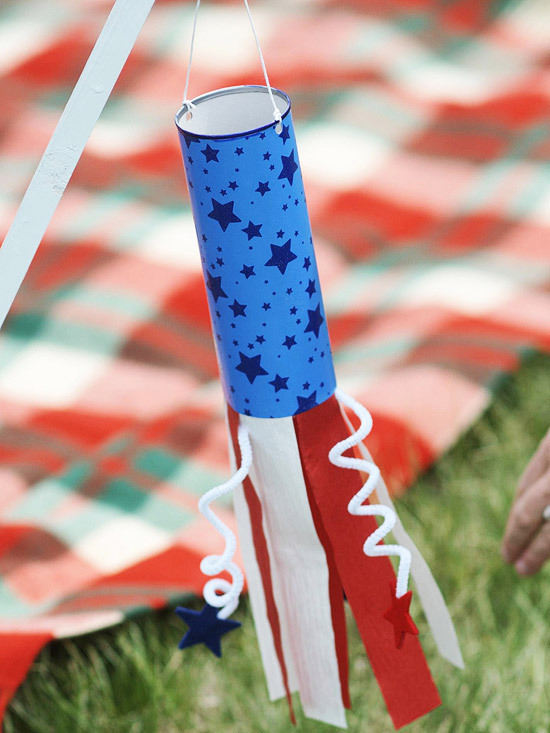 These firecracker crafts will spark some fun at your celebration. Start with mailing tubes that have plastic lids. 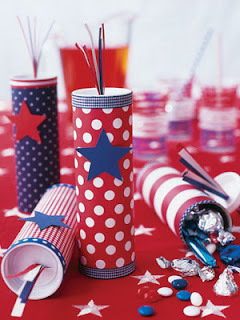 Cut red, white, and blue paper and ribbon to size; apply them to tubes using Perfect Glue.Trim each tube with a star cutout.Poke a slit in the lids and insert paper "fuses" into each hole.Fill with candy and enjoy. 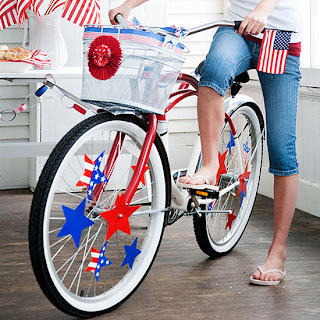 Kids will love sprucing up their bikes in star-spangled style (and you'll love using up leftover cardstock and ribbon). 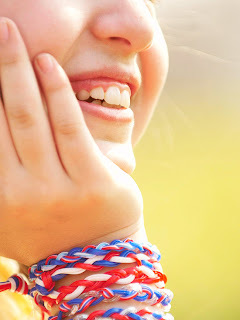 Set out some tape, miniature flags, and other red, white, and blue craft supplies such as construction paper and streamers, and let the kids dig in. 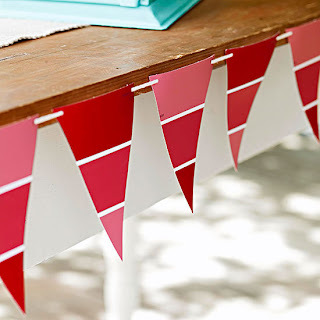 Craft pretty pennants from old paint chips for a simple and eco-friendly twist on traditional Independence Day banners. Create triangle templates for the kids to follow, then help them cut each paint chip to fit. You can vary the colors and create patterns by using blue or white paint chips. Next, cut small holes in the upper corners of each triangle. String them onto white yarn, making sure the yarn loops around the back of each flag. Tie the pennants to picnic tables, hang in doorways, or drape over railings for a festive welcome. For a quick and easy addition to your 4th of July party, rinse and clean six metal cans (old soup or vegetable cans work well). Paint patriotic stripes with acrylic paint. Let them dry for a few hours before handling. Stack the cans in a pyramid and toss beanbags to knock them down for a fun, all-ages yard game. Whoever knocks the most down wins! You can also plant flowers in each can and use them as table centerpieces. 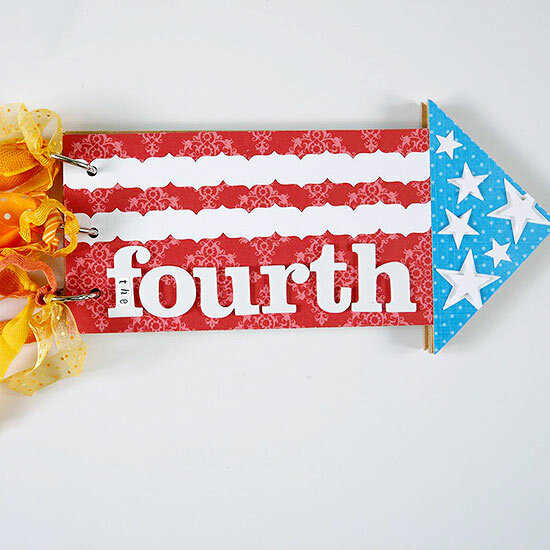 Turn a simple arrow-shape chipboard album into a fun firecracker keepsake. Purchase the album from a scrapbooking or crafts store, then gather your favorite crafts supplies. Use red paper to cover the base of the album, then use a glue stick to overlay white paper for the stripes. Trace and cut a triangle from blue paper to use for the firecracker tip. Finish your album with star stickers, ribbons, and adhesive letters. Fill the album with photos and memories of the 4th! 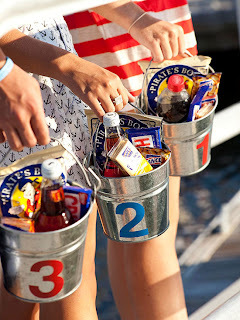 Help everyone keep track of their treats with these cute snack pails. Use number stickers or cut paper to label each one as shown, then have the kids help pick out their favorite snacks to put inside. Simple lengths of intertwined string, lacing, or ribbon have cemented camaraderie between generations of best buds. 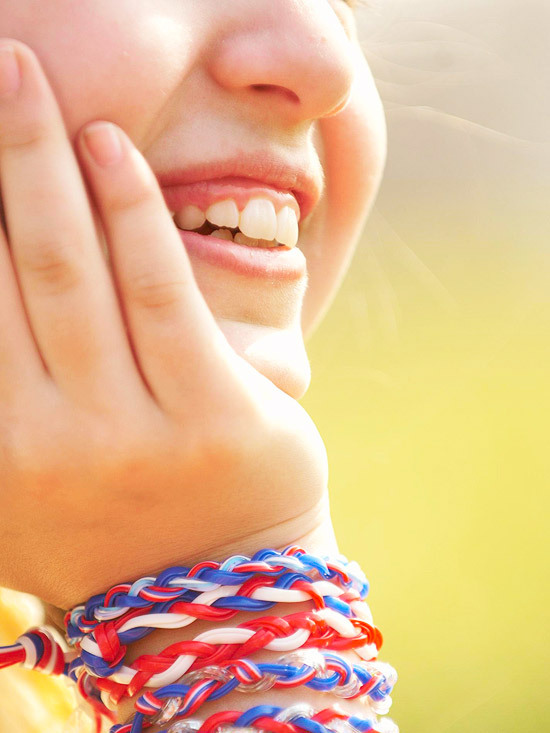 Weave a little patriotism into the classic craft with red, white, and blue lacing (available at crafts stores) braided into bracelets to give and to wear. Experiment with different combinations of strands and embellish with beads for added flair. Waiting for the fireworks to start can make kids (and adults!) antsy. 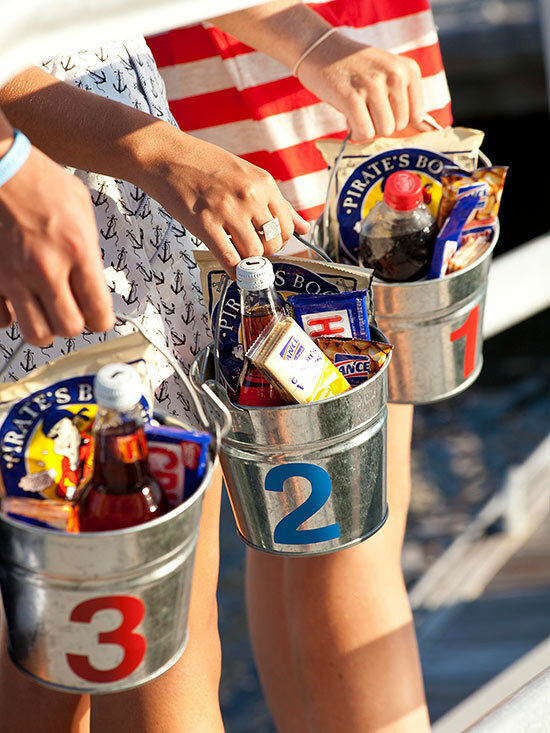 Make the wait pass quickly with snacks served in festive take-out containers. 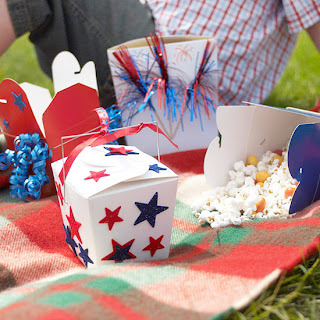 Give kids red, white, and blue take-out boxes (available at crafts or party stores) and an arsenal of stickers, ribbons, and other embellishments, and let their imaginations do the rest. Fill the decorated containers with popcorn or trail mix, grab a blanket, and settle in for a spectacular show. 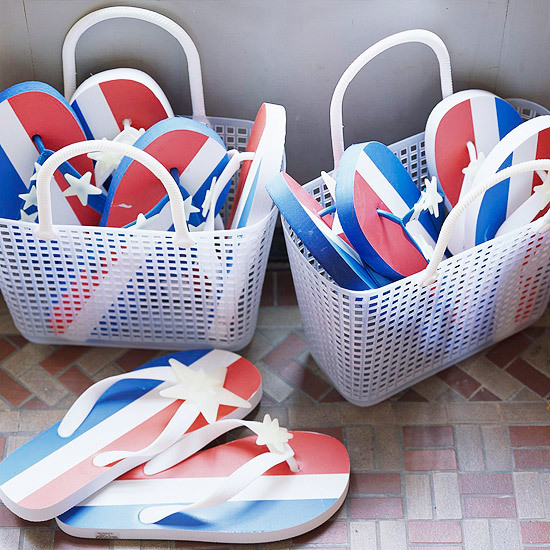 Add a little patriotic flair to your wardrobe with star-spangled flip-flops made especially for watching fireworks. Use hot glue to attach glow-in-the-dark stars to each flip-flop strap (we found flip-flops in three colors, but you could use solid-color shoes, too). The fireworks won't be the only thing lighting up the night. Make this red, white, and blue wind sock by gluing scrapbooking paper around a clean frozen juice-concentrate container, then extending paper a few inches beyond the can. Twist white chenille stems around a pencil for a curly shape, then tape them to the inside bottom edges of the wind sock. Add streamers in the same way. Inside the top, tape two equal-length pieces of fishing line across from each other so the wind sock is balanced; tie together at the top for easy hanging at a 4th of July celebration. 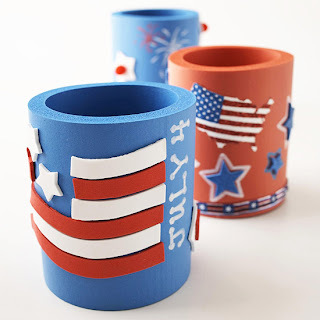 Plain foam beverage insulators become canvases for creativity on the 4th of July. 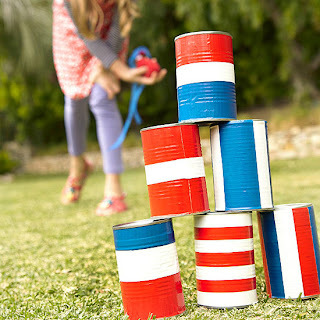 Dress them up with patriotic style by using paint pens and attaching sticker stars and stripes.